It would be understandable if James Ryan was rubbing his eyes with disbelief at the situation he finds himself in, but the 21-year-old is firmly rooted in reality as he lives his own dream. This is just the way it was meant to be. His career is no fairytale, rather the culmination of a lifetime spent working towards this moment. He could be a Grand Slam winner by his eighth cap, but there is no sense that this serious young man is getting carried away. He appreciates that people see his story and wonder, but can't see the value in indulging the remarkable story of his rise. "All I ever wanted to do is be a professional rugby player, since I could walk really," he says matter-of-factly. "It has always been the dream. "Obviously, I'm in a very lucky position. But, I can't be getting too sentimental or anything like that. In a week like this, we've got a huge Test match and if I lose track of that, I will get myself compromised. I'm staying process-focused." Those words will be music to Joe Schmidt's ears. The New Zealander has long been an admirer of a kid who has been turning heads since his early teenage years, a tall lock capable of powerful carries and a natural leader who is already being spoken of as a future Ireland captain. He has played just 10 times for Leinster but he's already a first-choice lock in the Irish system and a player who will be front and centre of the 2019 World Cup campaign. That's assuming he's fit, because there is a perception that the UCD student is struggling with the load. He missed last season with a serious hamstring injury and a succession of niggles have kept him out of action at various points of this campaign. Ireland rested him for the Italy game because of a groin issue and his predecessor Malcolm O'Kelly is among those who expressed fears about his durability. "It does frustrate me a bit," he says of the perception that he is injury-prone. "Most of the injuries I've had this year have been impact injuries. It's more of a case of my body getting used to this level; they are all niggles. I just have to come to terms with that. "I've been lucky the last few weeks, I haven't picked up anything. "I had some shoulder issues but I have a big emphasis now on pre-habbing that, managing these little niggles so further down the line they don't become things that keep me out of the game. "It's just part of an experience I had to go through." The transition to Test rugby was tough, but nothing he couldn't handle. "It is definitely a step up," he says. "Everything about it, the build-up to the game, obviously there is more at stake. There is more pressure. There is more expected of you. "The game itself, it's quicker, I found anyway. The physicality is huge. "I don't think it was a shock to the system. It was definitely a step up and I was definitely aware of it. But, I don't think it was me going, 'oh s**t'." He presents himself as a serious young man, but his team-mates have been attempting to draw his personality out. 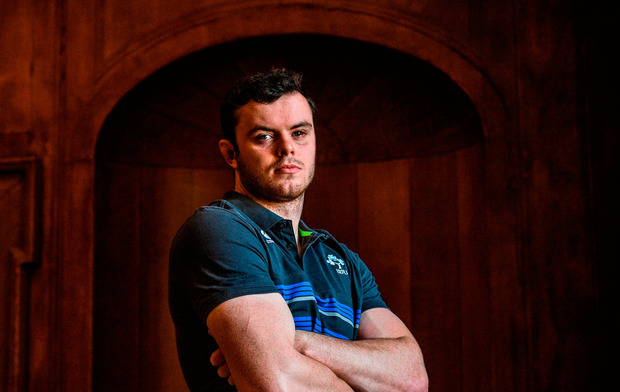 Cian Healy has handed over control of the team music on the bus and in the gym, while Dan Leavy has been spinning a yarn that Ryan has taken to introducing himself to people as 'The Big Cheese'. "No!" Ryan replies emphatically when the flanker's accusation is put to him. "Dan 'Lost My Wallet' Leavy has had a few things to say. He seems to lose his wallet at convenient times. Whenever the coffees and lunches come around he can't seem to find it." Unsurprisingly, he's able to give as good as he gets. Such is the way with this high-achieving 21-year-old who is fully lucid while living the dream. "The bus (journey) to the game has stuck out for me. And then afterwards the best part of it all was probably spending time after the wins with my parents, my brother and my family," he says. "Those are the bits that stand out for me. "I'll probably just sit back after the Six Nations and think about it."